Bangkok international airport Suvarnabhumi (BKK) is an important gateway for travel to the capital of Thailand Bangkok, domestic destinations within Thailand and to other points in Southeast Asia. It is the main hub of the flag carrier Thai airways , the regional subsidiary Thai smile and Bangkok airways. Suvarnabhumi airport handles over 60 million passengers annually, which ranks it among the busiest airports in Southeast Asia. A significant number of the Suvarnabhumi transit passengers catch connecting flights from the secondary airport in the capital - Don Muang (DMK), hub for Air Asia, Lion air and other low cost carriers. Don Muang airport handles domestic traffic of more than 23 million passengers annually. 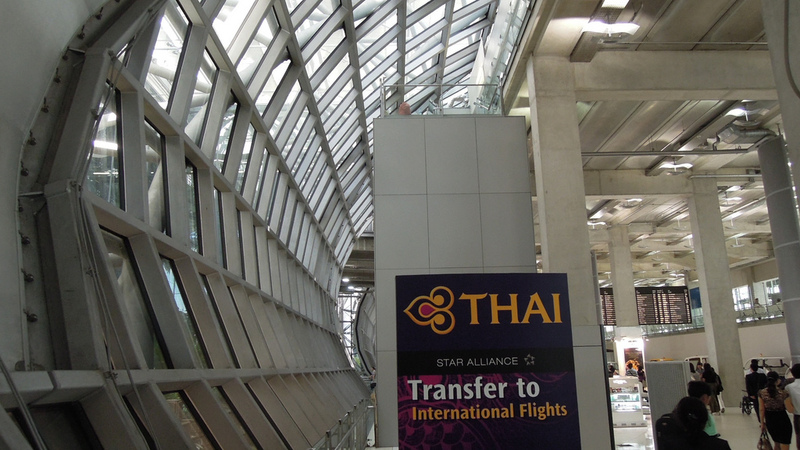 For your convenience there are also transfer desks of Thai airways in the airside part of the terminal. The minimum connection time for transit between an international and domestic flight is 75 min. However, exceptions exists and certain domestic destinations are served within a shorter connection time of only 55 min (identical to the International to International transfer). The main difference is that Thai airways and star alliance passengers heading to some domestic airports on designated flights may not clear immigration and customs in Bangkok airport, but rather do that at their final stop (e.g. the airport of Phuket). In these cases, the passport control is done in Phuket and the transit process at Bangkok ariport is quicker. In other cases, passengers heading for domestic flights need to clear immigration in order to formally enter the kingdom of Thailand. Some dedicated lanes are available for such transit passengers. According to unverified passenger reports, on average one needs at least 45 min to make a smooth transfer. Under this scenario, you would need to clear immigration by all means in order to enter the kingdom of Thailand. Under some circumstances, you can attempt airside transit, for e.g. if you have checked in online for your next flight, have the boarding passes at hand and travel with hand baggage only. Otherwise, you need to pick your baggage from the belt in arrivals, exit and then proceed to the departures area upstairs to check in for your next flight and drop off the bags (again). It is recommended that you allow yourself at least 2,5 h - 3 h to be on the safe side. Waiting at queues at immigration alone may take around an hour during peak times. It is quite common that a few large aircraft like the A380 land approximately at the same time. In case your self-connect at BKK is tight and this is beyond your control, you can try to book fast-track immigration clearance service. This may save you some time. 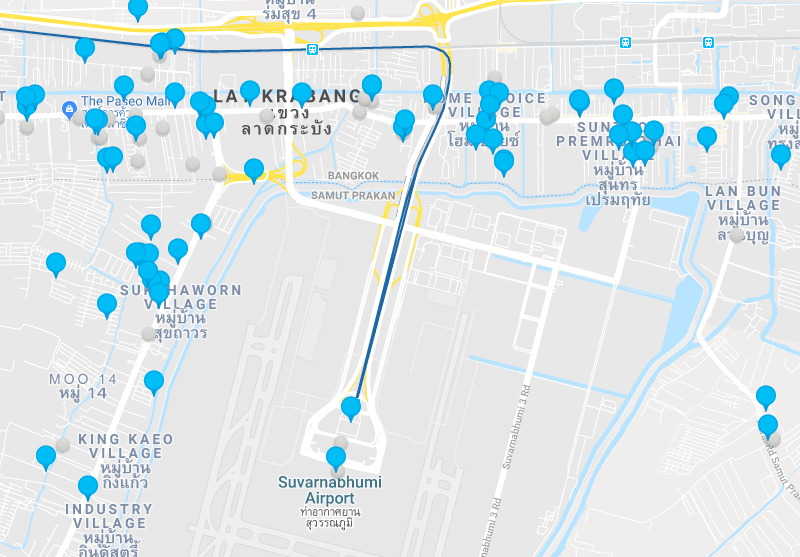 Let’s look into the self-connecting scenario of landing at Suvarnabhumi airport (BKK) and catching a domestic flight from Don Muang airport (DMK), which is situated some 35 km away. Under this scenario, you need to pass thru immigration, baggage collection and basically exit the terminal. The good news is that the Bangkok airport authorities have thought of this scenario as well. If you hold a valid ticket for your next flight, you can board a shuttle bus for free. The shuttle between both airports run from 5.00 am till 24.00 every day. Depending on the time of the day, buses depart every 20 min, 40 min or 60 min. You can find the shuttle bus stop on the first floor of the terminal at gate 6. The maximum travel time is 90 min, depending on traffic conditions. There is free wifi at Bangkok International airport (subject to registration and for a period of 2 h). There are plenty of duty free shopping areas and dining places as well as lounges (Thai airways Royal first lounge, SilverKris lounge, Miracle first class at Councourse G). Prices are typical for an international airport, but by all means higher than in downtown Bangkok. There are few relax zones with arm rest chairs, which are so precious for passengers having longer stopovers. Such places can be found in the landside areas too (suitable for self-connecting passengers).